Late yesterday, the DfE published the "Indicative draft Code of Practice" as a "work in progress" to go with the SEN/D provisions in the Children & families bill, now going through parliament. The SEN Code of Practice is statutory guidance that provides practical advice on how to carry out statutory duties to identify, assess and make provision for children and young people’s SEN as set out in the Children and Families Bill (currently before Parliament). The Code also sets out how legislation and regulations concerning children and young people with disabilities works alongside this. The DfE says a subsequent draft for formal consultation will be produced later in 2013. After this, a final draft will undergo Parliamentary scrutiny in time for it to come into force alongside the Children and Families legislation. This Indicative CoP is a sort of rough draft devised from early pathfinder learning and from the consultation that took place when the earlier versions of the C&F bill were published. Additionally it published 'Illustrative Regulations" and an "SEN Evidence Pack" pulling together the information that has informed the Bill. It just isn't possible to write an in-depth analysis of an 86 page document and two additional publications here in less than 24 hours. We'll be bringing you that in the course of the next few weeks. The text uses the word MUST to refer to a statutory requirement and SHOULD to refer to guidance which is a non-statutory requirement. It emphasises the need for a fully engaged Health system through Clinical Commissioning Groups and other health bodies. Clinical Commissioning Groups (CCGs) and, where responsible for children and young people with SEN, the NHS Commissioning Board, will be full partners in the new arrangements for securing the provision to meet these needs. This is obviously a great idea, but, judging from what I'm reading in the press about the difficulties CCGs are facing before they've even fully launched, one can't help but feel...uneasy at best. Parents/carers figure heavily in the document, particularly in relation to helping for develop services at a strategic level and on a family level about schools fully involving parents when it comes to how their child will be helped. Some teachers and indeed, many parents, will find this quite difficult for many reasons and this is why culture change on both sides is vital. The CoP document talks about Parent-Carer forums and the support and remuneration they need to be fully engaged, although it does not detail what this should be. 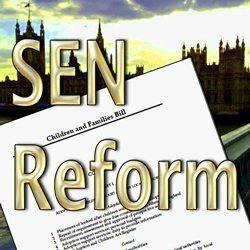 Schools and colleges need to ensure that they fully engage parents and young people with SEN when drawing up policies that affect them. Pupil forums should always ensure that there is representation from pupils with SEN. Schools and colleges should also take steps to ensure that parents and young people are actively supported in contributing to assessment, planning and review processes. The knowledge and understanding that parents have about their child is key information that can help teachers and others to meet their child’s needs. Enabling parents to share their knowledge and engage in positive discussion instils confidence that their contribution is valued and acknowledged. A key approach that ensures that parents and carers, children and young people are actively placed at the heart of the system is person centred planning. A person centred approach to planning means that planning should start with the individual (not with services), and take account of their wishes and aspirations, and the support they need to be included and involved in their community. It aims to empower parents, children and young people so that they have more control over assessment and decision-making processes. It enables continual listening and learning, focusing on what is important to someone now and in the future, and acting on this in partnership with their family and their friends. The integrated arrangements for commissioning services for children and young people with SEN must promote the involvement of children and young people, and their parents, carers and representatives in decisions which relate to their care, and in the development and review of a local offer of services, derived from commissioning plans which reflect the strategic participation of local young people and their families. CCGs will want to engage with Healthwatch organisations, patient representative groups, Parent-Carer forums and other local voluntary organisations and community groups to do this. Really, will they? As far as I can see, health/patient/parent engagement is at a very nascent stage and in many areas, embryonic or not even a twinkle in the eye. Let's be hopeful though. If it's mandated, they'll have to at least make an effort. Won't they? Joint commissioning is an on-going process and local authorities and their partner CCGs must keep the arrangements under review. Local authorities also have a duty to keep under review the special educational provision and social care provision in their areas for children and young people who have SEN . This will be a full time job for someone. In Surrey, an SEN Quality Assurance officer has been appointed already and so presumably this will be part of the role's remit. Two new Health Liaison Posts? The document talks "Designated Medical Officer for SEN". This person might, apparently, be an employee of an organisation such as a CCG or NHS Trust. They will have responsibility for co-ordinating the role of the health body in statutory assessment and MUST work strategically across health, social care and local government. They must... have good relations with local commissioners who are partners in the joint arrangements for SEN, working to ensure effectiveness in co-operation, and encouraging and supporting the optimum use of flexibilities for joint working (e.g. through partnership arrangements and pooled budgets). They must provide a means for the local authority to access expert medical advice – for example, on whether or not a child can attend school, or on medical evidence provided in support of a school application - but may also be required to provide or facilitate access to, advice or support for the health community on SEN, particularly when health services are preparing reports on children. Whilst the advice and support may be provided by a number of health and care professionals as appropriate, the designated medical officer must be an identified, qualified and registered medical practitioner, with the appropriate training and/or experience to exercise this role in relation to children and young people with SEN. The search had better get underway in LAs and CCGs across the land if they're to stand a hope of finding such a person and training them in the ways of the different authorities they're supposed to work across. Another role is a similar function within social care. Social care teams have a range of duties and responsibilities towards children and young people with SEN.
Social care departments may find it useful to designate an officer or officers to support their social care teams in undertaking these duties and to act as the central point of reference for the local authority’s SEN teams on matters related to social care. Although 'may find it useful' may be taken as meaning, sweep it under the carpet, there's no money in the pot. There is a long section on the Local Offer of services and the document underlines the point that a "Local Offer' should not be simply a list of existing services but should be used to improve the local offering for children with SEN/D. The big question has been what will replace the School Action & School Action + levels of SEN that are being abolished along with the statement. It's fine to say, as the document does, that all teachers should be teachers of children with special educational needs, but we all know that mainstream teachers are trained to be mainstream teachers and a HUGE programme of extra training is going to be needed if there are not structured levels such as exists at the moment. The document talks about all the tasks that a SENCO should be carrying out, but when my boys were in mainstream, the SENCO (who was great) was also a year head, class teacher, head of PE and Deputy Head. In my personal opinion, a SENCO should be just that. A SENCO whose sole duty it is to identify, organise, monitor and review the progress of children with an SEN. They should be listening to those children and, where appropriate, organising nurture groups to support those whose support needs may look like a SEN but may, in fact, stem from an unmet emotional or social need. Additionally, they should be monitoring the quality of SEN provision from the school's teachers and be liaising regularly with parents (and it does say that in this document). It's a full time job all by itself. And they should be part of the school's senior management team. Before providing a child or young person with the Additional SEN Support, a rigorous assessment of SEN should be undertaken by the institution using all available evidence/data sources, such as attainment and historical data, the child or young person’s development in comparison to their peers, information from parents and, if relevant, advice from external support services. How will this be funded? It will be 1. "agreed locally" and be from "the delegated schools budget", but early on in the select committees they were talking about clawing back the delegated budget. So what's it to be? That's it for now, we'll have more next week, when we've had time to read it in detail. they changed the address of the pdf when they realised they’d made a spelling mistake. You and Debs are doing a fantastic job and I’m thrilled you have joined forces. Field Fisher Waterhouse are providing their venue in Vine St FREE for this years Towards a Positive Future Conference providing we can move it to Thursday 20th June 2013. This means we can greatly reduce costs for parents etc to attend. Would you and Debs be speakers? I have another parent Jane Raca, Jane McConnell CEO of IPSEA and Charlie Mead. Could you cheekily invite Mr Timpson when you meet him on Monday ? Also have you got contact details for Maria Hutchings? I am SOOOO glad that we parents have this fantastic support! (from Special Needs Jungle I mean, not the government!) Some of the ideas sound fab in theory, but as I’m sure you know, without funding and training to underpin the ideas and make them happen, they are empty words. Our SENCO has 2 hours a week for the role. Wholly inadequate in my opinion!